Munich - 1. FSV Mainz 05 are a team enjoying a fantastic season, and one player above all has stood out in their superb rise to the brink of European qualification. Japanese international has experienced a new lease of life since joining the club last summer. He has scored more goals this season than he managed in three years at previous club VfB Stuttgart, and is on the verge of breaking the record for goals scored by a Japanese player in a single Bundesliga season. • Okazaki's latest brace takes him up to 13 goals for the current campaign, level with Shinji Kagawa's one-season record total for Borussia Dortmund in 2010/11. One more in the final three league outings will thus see the Mainz frontman overtake his namesake and establish a new outright best-mark. • The most goals scored by any Japanese player in the Bundesliga is 26, netted by Yasuhiko Okudera in 234 appearances over the course of nine years at 1. FC Köln, Hertha Berlin and Werder Bremen (1977-1986). Second on the list, with one goal fewer in 135 games for Hamburg and Eintracht Frankfurt between 2003 and 2007, is Naohiro Takahara. Third now is Shinji Okazaki on 23, two more than Kagawa. • Converted into goals per minute, a rather different pecking order emerges. Kagawa's 21 in 3786 averages out at one every 180.29 minutes or, in other words, pretty much exactly one every two games. Okazaki is second in this category, with one every 261.57 minutes, although at his current rate that gap is narrowing by the week. Indeed, Japan's likely frontman at this summer's FIFA World Cup in Brazil has notched more goals in his 30 league outings to date for Mainz than he did in 63 games for Stuttgart (ten). • Notably, ten of Okazaki's 13 strikes so far for Mainz have come on the road, a single-season high for a Japanese player with something to spare. Okazaki's 23-goal tally leaves him out on his own in the scoring stakes, with 1. 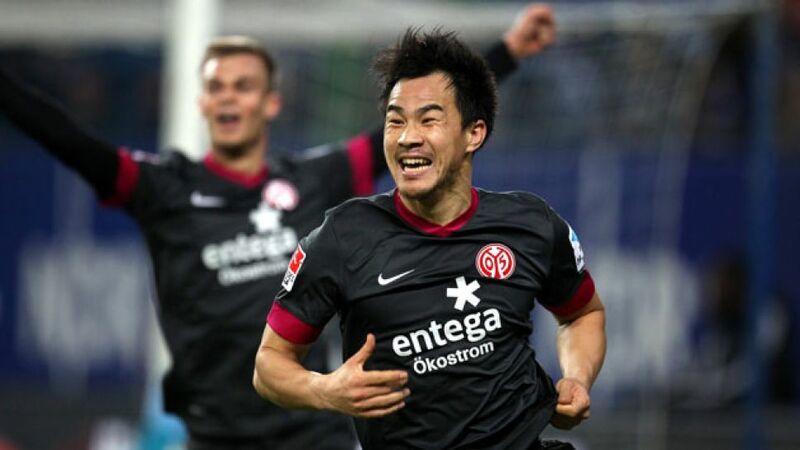 FC Nürnberg playmaker Hiroshi Kiyotake the next best placed on seven, one more than Eintracht Frankfurt's Takashi Inui, Makoto Hasebe (five), Hajime Hosogai (three), Hiroki Sakai and Atsuto Uchida (one apiece) are the other goalscoring Japanese stars active in the top flight at the moment.